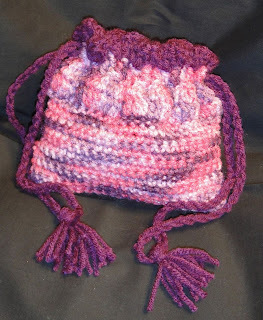 This bassinet purse is a Christmas gift I made for a cute little 2 year old girl. They work great for doctor/dental appointments, church, or anywhere else where your child has to wait. They are small and easy to carry. It's basically a drawstring bag that, when turned inside-out, becomes a bassinet for a small doll. This doll is $1 at Wal-mart. You could also use the 5-inch Berenguer doll. You can make little outfits for them and they're cuter! They seem to end up being about $8-9 with shipping if you buy them individually. You can get them for around $5 if you buy in bulk. I'm still looking. I didn't use a pattern for this one. I have one of these for my daughter and I used that to make my own. It turned out well, but I didn't write the pattern down (oops). I did, however, find a similar FREE PATTERN on Daisy Designs. She also has pictures of 3 different doll choices, including the two I've mentioned.